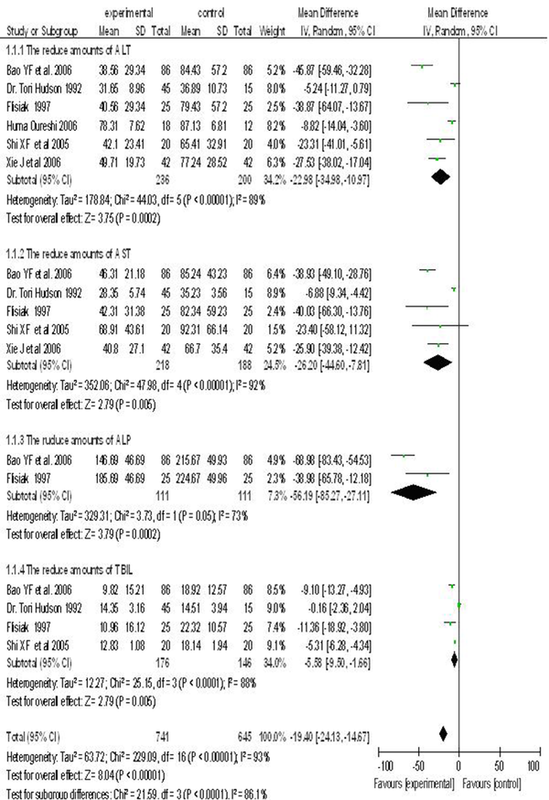 To Cite: Long L, Xue C, Shi J, Dong J, Wang L. Efficacy of Hepatoprotective Agents With or Without Antiviral Drugs on Liver Function and Fibrosis in Patients With Hepatitis B: A Meta-Analysis, Hepat Mon. 2015 ; 15(7):e29052. doi: 10.5812/hepatmon.29052v2. Context: To systematically evaluate the effects of hepatoprotective agents, when delivered either alone or in combination with other antiviral or non-antiviral drugs in patients with hepatitis B and hepatic fibrosis. Objectives: The current randomized controlled clinical trials aimed to evaluate the efficacy of combinations of antiviral and non-antiviral hepatoprotective agents on indexes of liver function and liver fibrosis in patients with hepatitis B. Data Sources: Published literatures in Chinese and English on hepatoprotective treatment strategies for chronic hepatitis B and liver fibrosis were searched in three databases and randomized controlled clinical trials were selected. Study Selection: Data were extracted according to a variety of inclusion and exclusion criteria. Meta-analysis was employed to analyze the data. Results: A total of 22 randomized controlled trials encompassing 1,714 cases were considered in the meta-analysis. The obtained results indicated that the combination of antiviral drug and hepatoprotective agent was better than antiviral drug alone to improve liver function. Similarly, regarding liver fibrosis, using two different hepatoprotective agents was better than using one agent. The normalization rates of Aminotransferase (ALT) and total Bilirubin (TBil) were improved 25.7% by two hepatoprotective agents compared to the single agent. Acetylcysteine was superior to ursodeoxycholic acid or silibinin to reduce ALT. Ursodeoxycholic acid was superior to acetylcysteine or silibinin to reduce TBIL. Conclusions: Hepatoprotective agents combined with antiviral drugs can significantly improve liver function and liver fibrosis parameters in patients with hepatitis B. At present, Hepatitis B Virus (HBV) infection is an important public health problem worldwide. Hepatitis B can lead to serious liver diseases, including cirrhosis, liver cancer. In China, approximately 120 million people are infected with the Hepatitis B Virus (1). Alavian et al. reported that about 1 million people are infected with HBV in Iran, and 15% to 40% of the patients with hepatitis B may develop cirrhosis or liver cancer (2). Liver fibrosis is a healing response, but the excessive accumulation of extracellular matrix (ECM) components in the liver often leads to severe forms of liver fibrosis, and ultimately cirrhosis with liver dysfunction (3-5). Early cirrhosis may be reversible. Therefore, prompt diagnosis and intervention are critical in limiting disease progression (6). Clinically, the existing hepatoprotective agents include Ursodesoxycholic acid (UDCA), silibinin, and N-acetylcysteine (NAC). UDCA is a hydrophilic bile acid, which alters the ratio of hydrophilic-to-hydrophobic components in the bile acid pool. It promotes the secretion of endogenous bile acids such as chenodeoxycholic and lithocholic acid, and improves cholestasis. UDCA is mainly used to treat primary biliary cirrhosis, hepatitis B associated liver fibrosis, and cholestatic liver disease, the efficacy is certain. Some studies reported that UDCA protects liver cell membrane and enhances immune function. These mechanisms may be related to the ability of ursodeoxycholic acid to regulate cell cycle, apoptosis and protein biosynthesis of liver cells. Alternatively, the increased pool of hydrophilic bile acid and the stability of the cell membrane may play an important protective role (7, 8). UDCA, which causes minimal damage and is non-toxic to liver cells, is an effective hepatoprotective agent and cholagogue (9). Results of long-term observational studies showed that ursodeoxycholic acid can significantly reduce the development of hepatic fibrosis (8, 10, 11). Silibinin is derived from milk thistle, an important medicinal plant that is roots, leaves and seeds exert a variety of therapeutic effects, including hepatoprotective, antioxidant, and anti-lipogenic properties (12). In the United States and Europe, about 65% of patients with liver disease use Chinese medical preparations which include milk thistle as their most common ingredient (13). Silymarin, a mixture of flavonoids and wood ester pigment compounds, is extracted from milk thistle seeds. Silymarin contains silibinin, silychristin, and silymarin Ning with a large amount of silibinin. it is noteworthy that, silibinin is the main active ingredient of silymarin (14). In recent years, silibinin has been used to treat liver cirrhosis, hepatitis, liver fibrosis and alcoholic liver disease (15). N-acetylcysteine (NAC) is an intracellular glutathione precursor, which can enhance the activity of glutathione transferase and promote the detoxification of free radicals. nitric oxide (NO) and its metabolite can improve microcirculation, increase tissue oxygen, and enhance the repair of damaged tissue (16, 17). In recent years, clinical studies have demonstrated that NAC is not only effective to treat liver failure caused by excessive acetaminophen (paracetamol), but is also useful for liver disease arising from other causes (18). NAC reduces serum Total Bilirubin (TBil) and aminotransferases, and increases Prothrombin activity (PTA) in patients with severe chronic hepatitis B (19). The current study aimed to search randomized controlled clinical trials to evaluate the efficacy of antiviral and non-antiviral hepatoprotective agents combinations on the indexes of liver function and liver fibrosis in patients with hepatitis B. Papers written in either English or Chinese describing the use of hepatoprotective agents to treat hepatitis and liver fibrosis were retrieved. Using “chronic hepatitis B, hepatitis B, HBV, liver fibrosis, hepatoprotective, silibinin (silymarin, silybin meglumine), acetylcysteine and ursodeoxycholic bile acid (UDCA)”, the study retrieved papers indexed in the China national knowledge internet (CNKI) (2000 - 2012), Pubmed (19832013), Embase (2000 - 2013) and Cochrane databases (1992 - 2012). Hepatitis B infection or liver fibrosis; chronic hepatitis B was diagnosed if HBV history or HBV markers were persistently positive for more than six months and serum alanine aminotransferase levels exceeded 80 IU/L, and hepatic fibrosis was estimated by indexes containing the following markers: HA, LN, C-IV, PIIIP (13). Results indicators including Alanine Aminotransferase (ALT), Aspartate Aminotransferase (AST), TBIL, gamma-Glutamyl Transpeptidase (γ-GGT), Alkaline Phosphatase (ALP), Hyaluronic acid (HA), Laminin (LN), Collagen type IV (CIV), and Procollagen III peptide (PIIIP). Trials were limited to those comparing the efficacy of different drugs or placebo. Studies in which non-protective liver drugs were used to treat viral hepatitis or liver fibrosis; animal experiments and reviewed papers that did not contain clinical data; pregnant and lactating female patients with liver disease. The therapy course was less than three weeks; liver biochemical markers were normal. Outcomes were reported in terms of efficacy as follows: 1) Markedly effective: patients underwent full recovery or exhibited significant improvements in their clinical symptoms; levels of ALT, AST, GGT, TBIL and other basic indicators of liver function were restored to within the normal range. 2) Effective: moderate improvement of clinical symptoms, signs and liver function. 3) Ineffective: no obvious improvement or exacerbation of symptoms, signs and liver function indexes. RevMan5.2 software was used to analyze the data. For classified data, risk ratio (RR) and 95% confidence interval (95% CI) were used. For continuous data, weighted mean difference (WMD) and 95% CI were used. If I2 < 50%, the test was considered uniform with no statistically significant heterogeneity, the fixed effects model was used if I2 > 50%, a random effects model was used. A Funnel plot was used to evaluate possible publication bias. Two authors discussed all data sets before extracting them from the published literature. To avoid subjective bias, names of the authors, publications, year, and country were omitted during the data extraction process. Retrieved data included: (1) liver biochemical indicators: ALT (U/L), GGT (U/L), ALP (U/L) and TBIL (U/L); (2) liver fibrosis markers: HA (μg/L), LN (μg/L), IV-C (μg/L) and PIIIP (μg/L). Disagreements were resolved by discussion and consensus. Initially, 245 papers were retrieved by screening the title, abstract, and inclusion and exclusion criteria. Finally, 22 standard randomized controlled trials were included, with a total of 1,756 subjects, among whom 893 subjects were in the treated group, and 821 subjects were in the control group (Table 1). 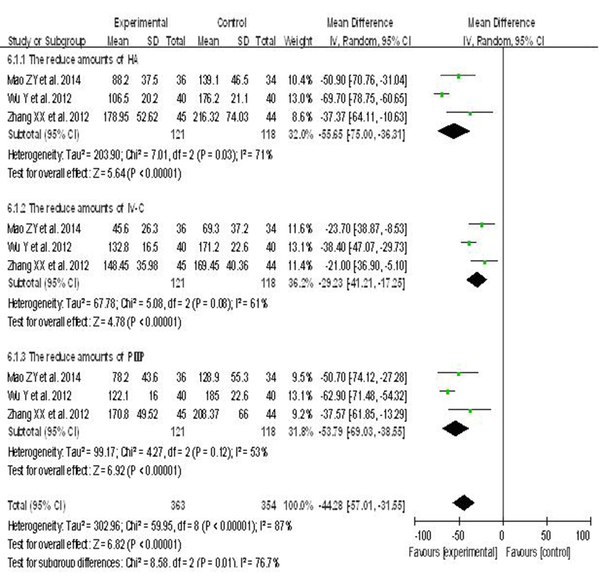 The meta-analysis groups were: 1) liver protective drug plus antiviral drug versus antiviral drug alone to assess efficacy of altering ALT, AST, ALP and TBIL levels (Table 1; Figure 1); 2) liver protective drug (treatment group) versus placebo to assess protective effects in terms of ALT and TBIL (Table 1; figures 3 and 4); 3) combination of two hepatoprotective agents versus a single agent in terms of ALT, AST, ALP, GGT, TBIL (Table 1; Figure 4); 4) one protective agent versus another in terms of normalization rates of ALT and TBIL (Table 1; Figure 5); 5) evaluation of the effects of a combination of two kinds of protective agents versus a single protective agent in terms of HA, LN, IV-C and PIIIP (Table 1; figures 6 and 7) as hepatic fibrosis markers. Six randomized controlled trials reported on the use of a hepatoprotective drug in combination with an antiviral agent treatment of chronic hepatitis B. The test and control groups included 741 and 645 subjects, respectively. There was a statistically significant heterogeneity between the studies (I2 > 50%), and hence, a random-effects model was used. 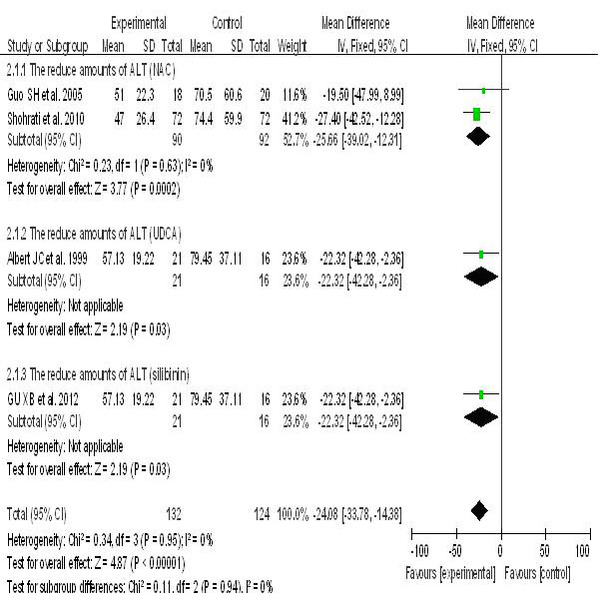 Meta-analysis showed that using a combination of hepatoprotective and antiviral drugs was more effective than a single antiviral agent to reduce serum levels of ALT, AST, ALP and TBIL. ALT (WMD = -22.98; 95% CI (-34.98, -10.97)), AST (WMD= -26.20; 95% CI [-44.60, -7.81]), ALP (WMD = -56.19; 95% CI [-85.27, -27.11]) and TBIL (WMD= -5.58; 95% CI [-9.50, 1.66]) (Figure 1). In patients with chronic hepatitis B infection treated with combination hepatoprotective and antiviral drug vs. antiviral drug alone. Data are presented as pooled mean difference using a random-effects model and 95% confidence intervals. Five randomized controlled clinical trials reported the effects of three hepatoprotective agents compared with placebo on liver function indexes in patients with chronic hepatitis B, including ALT and TBIL. In these trials, the control and treatment groups included 144 and 140 subjects, respectively; since there was no significant heterogeneity between the studies (I2 < 50%), a fixed effect model was applied. Meta-analysis showed that all three hepatoprotective agents significantly decreased ALT levels in patients with hepatitis B. NAC was associated with greater efficacy compared to UDCA and silibinin. The impact of UDCA and silibinin on ALT levels in patients with hepatitis B were considerable: NAC (WMD = -25.66; P = 0.0002, 95% CI [-39.02, -12.31]), UDCA (WMD = -22.32; P = 0.03, 95% CI [-42.28, -2.36]), silibinin (WMD = -22.40; P = 0.11, 95% CI [-49.52, 4.72]) (Figure 2). In patients with chronic hepatitis B infection treated with hepatoprotective drugs vs. placebo. Data are presented as pooled mean difference using a random-effect model and 95 % confidence intervals. 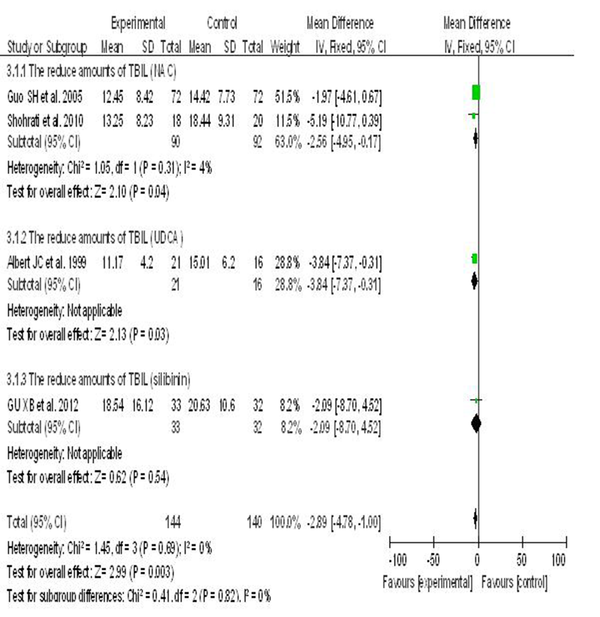 UDCA was superior over NAC and silibinin to reduce TBIL in patients with hepatitis B. Meta-analysis showed that NAC (WMD = -2.56; P = 95% CI [-4.95, -0.17]), UDCA (WMD = -3.48; 95% CI [-7.37, -0.31]), silibinin (WMD = -2.09; 95% CI [-8.70, 4.52]). 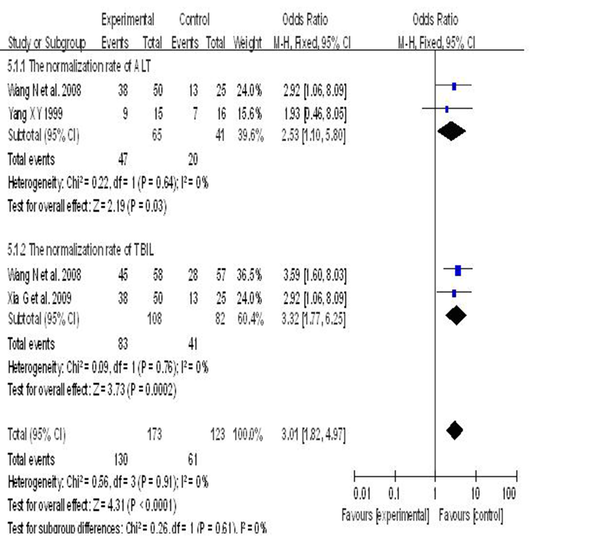 However, the differences were not statistically significant (I2 = 0%) using a fixed-effects model (Figure 3). In patients with chronic hepatitis B infection. Data are presented as pooled relative risks using a fixed-effect model and 95 % confidence intervals. Five randomized controlled clinical trials were employed to test the efficacy of two hepatoprotective agents compared to only one to treat patients with chronic hepatitis B. There were 618 subjects in the two hepatoprotective agents, and the single hepatoprotective agent groups, respectively. The heterogeneity between the studies was statistically significant (I2 > 50%). Using a random effects model, meta-analysis showed that the two hepatoprotective agents group was better than the single agent to reduce ALT, AST, GGT, ALP and TBIL levels in patients with hepatitis B. ALT (WMD=-31.44; 95% CI [-48.57,-14.32]), AST (WMD = -14.54; 95% CI [-29.24, 0.16]), GGT (WMD = -26.98; 95% CI [-54.66，0.70]), ALP (WMD = -29.86; 95% CI [-52.65, -7.07]), TBIL (WMD = -4.84; 95% CI [-9.86, 0.18]) (Figure 4). In patients with chronic hepatitis B infection treated with the combination of two liver protective drugs vs. one liver protective drug. Data are presented as pooled mean difference using a random-effect model, and 95% confidence intervals. Three randomized controlled clinical trials reported the effects of combining two hepatoprotective drugs compared to a single agent on the recovery rate of liver indicators in patients with hepatitis B; 173 subjects who used a combination of two agents were compared to 123 subjects who used only one agent. The heterogeneity between the studies was statistically significant (I2 = 0%, P = 0.98). Therefore, a fixed-effects model was used. Compared with the single agent group, meta-analysis showed that using a combination of two hepatoprotective drugs was more effective than only one in restoring liver indicators to normal levels (two hepatoprotective agents group vs. single hepatoprotective agent group = 75.2% vs. 49.5%). ALT (72.3% vs. 48.7%, RR = 1.44, 95% CI [1.01, 2.04]), TBIL (77.8% vs. 50%, RR = 1.53, 95% CI [1.21, 1.95]). The recovery rate of the group that used two hepatoprotective agents was 25.7% higher than the one treated by a single agent, (RR = 1.50, P < 0.0001, 95% CI [1.23, 1.83]) (Figure 5). In patients with chronic hepatitis B infection treated with two vs. one hepatoprotective agent. Data are presented as pooled relative risks, adopted fixed-effect model and 95 % confidence intervals, by trial. Three randomized controlled clinical trials reported the effects of hepatoprotective agents on liver fibrosis markers, HA, IV-C and PIIIP. From the three studies, the test and control groups consisted of 121 and 118 subjects, respectively. The heterogeneity between the studies was statistically significant (I2 > 50%). Thus, a random-effects model was used. The results indicated that hepatoprotective agents were indeed associated with improved indices of hepatic fibrosis compared to placebo: HA (WMD = -55.65, 95% CI [-75.00, -36.31]), IV-C (WMD = -29.23, 95% CI [-41.21, -17.25]), PIIIP (WMD = -53.79, 95% CI [-69.03, -38.55]) (Figure 6). In patients with liver fibrosis. Data are presented as pooled mean difference using a random-effects model and 95 % confidence intervals, by trials. Four randomized controlled clinical trials reported the effects of combined hepatoprotective agents versus a single agent on the liver fibrosis index, LN. The group representing the combined hepatoprotective agents included 151 subjects, whereas the single hepatoprotective agent group had 148 subjects. There was no significant heterogeneity (I2 < 50%); therefore, a fixed-effects model was used. 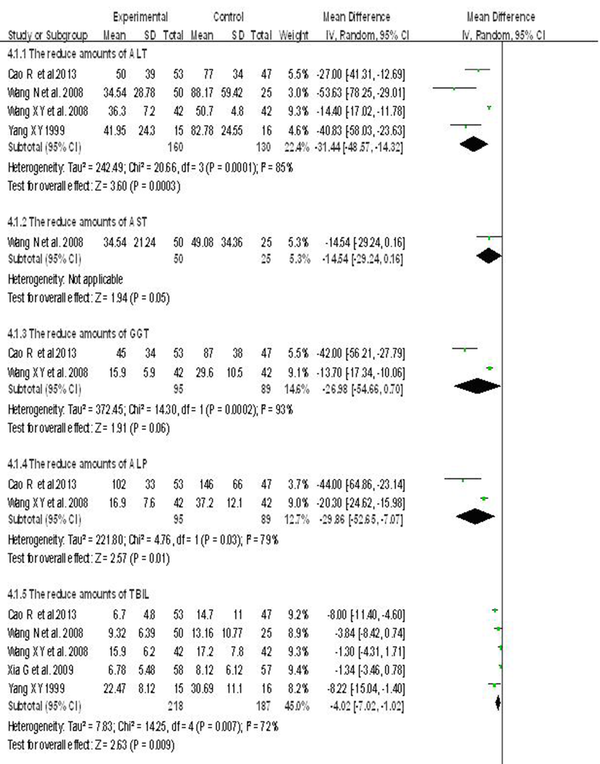 Meta-analysis showed that the two hepatoprotective agents was superior to the single one in terms of reducing LN levels (WMD = -33.91, 95% CI [-40.51, -27.31]) (Figure 7). Data are presented as pooled mean difference using a random-effects model, and 95% confidence intervals. 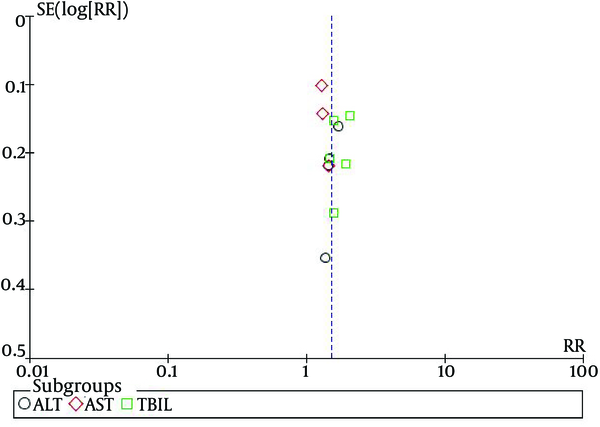 A Funnel plot analysis of bias among 12 trials on the effects of hepatoprotective agents on normalization of ALT, AST and TBIL was conducted, in patients with hepatitis B (Figure 8). The Funnel plot showed that the distribution of the samples were asymmetrical, suggesting that some of the test methodologies may have been of low quality, and publication bias may have been present. The current model is expected to maximize long-term treatment of severe liver disease caused by HBV infection to suppress the virus, improve inflammation and necrosis, and deliver adjuvant therapy to manage complications. The results of the current study showed that after a certain treatment course of a combined hepatoprotective and antiviral drugs, liver function and fibrosis index decreased in most of the subjects. Combination therapy was more effective than a single hepatoprotective agent to reduce liver cell damage, promote the liver cell membrane and promote the recovery of liver function, and it may delay the formation and development of hepatic fibrosis (38). Some studies showed a synergistic effect between hepatoprotective agents and antiviral drugs. It may be related to the improvement in drug tolerance due to hepatoprotective agents in patients with hepatitis B (34, 40). In 2006, Qureshi et al reported that large doses of ursodeoxycholic acid reduces ALT levels in patients with hepatitis B (28). The meta-analysis of the current study showed that acetylcysteine, ursodeoxycholic acid and silibinin significantly reduced ALT, and were a liver function marker in patients with hepatitis B. The reduction in ALT levels by acetylcysteine was better than ursodeoxycholic acid and silibinin. This may be related to the ability of acetylcysteine to inhibit the expression of serum II-18, IFN-γ and NO in the patients with hepatitis B. Some studies stated that acetylcysteine should be used, and that it was more beneficial in early stages of liver disease (21). The limitations of the study included the retrospective nature, variability of the quantity, quality and sources of the hepatoprotective agents, and the variability, and effectiveness of the antiviral agents. High-quality multi-center, large sample, randomized, double-blind and controlled clinical trials are necessary to confirm the current observations. In conclusion, hepatoprotective drugs can effectively improve serum liver markers in patients with liver fibrosis when combined with antiviral or other hepatoprotective agents. The current work was supported by the social development research project of Shaanxi science and technology agency (No. 2012k14-04-01) and the project of Xi’an medical college (No. XYFY11-02). Authors’ Contributions: Authors had equal contribution. Funding/Support: The current research was financially supported by Shaanxi Science and Technology Agency (No. 2012k14-04-01); the project of Xi’an Medical College affiliated hospital (No. XYFY11-02).